We can only hope when King Kong’s done here he tears down the rest of Branson too. So, I had HIGH hopes for Branson. I love cheese, and I’ve heard that Branson is the undisputed champion of cheese, the frontline of fromage. It was like I was heading to Disneyland the next day, I tossed and turned imagining what this amazing city would be like. I imagined Elvis’s everywhere. Good ones, bad ones, fat ones, even homeless ones. I dreamed about Tony Orlando AND Dawn. Instead of snoring, I giggled uncontrollably at a Yakov Smirnoff joke about television channels in Russia (“only two, first channel propaganda, second channel KGB officer telling you ‘turn back to channel one’”). When we awoke early, I let Victoria know that we might not be back to the RV until well after 9:00 tonight, so be prepared to sleep in tomorrow, cuz we’re gonna party it up! We stopped briefly at a great breakfast diner called “Billy Gail’s” on Highway 265. The place is locally-owned and famous for their enormous portion. Unfortunately, due to my recent loss to the pancakes over at Charlie Parker’s, my innards weren’t prepared for another battle. When we each ordered two eggs over medium with wheat toast, the waitress stood for a moment dumbfounded and said, “are you sure that’s all you want?” Apparently, they’re not used to a man my size ordering the same as the lady – or a lady ordering a lady’s portion for that matter. After rushing through the meal, we were only moments from our first disappointment. First of all, the “strip” as they refer to it is a nearly uncrossable stretch of Highway 76 that has so much traffic that I’m surprised we made it across the two tries we made – a third definitely would have been pushing it. In addition, Branson is so hilly and humid, that we have no idea how anyone could “walk” the strip, but apparently they don’t as we were the only schmucks that were. The strip is filled with all the standard tourism faire – Ripley’s Believe It or Not Museum, a Hollywood Wax Museum, and all the “Old Time photos” you have money for. 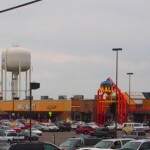 There are also at least 5 putt-putt courses, three go-kart tracks, 10 “western wear” outlets and the Branson Mall, which has a free live stage show and whose anchor stores are WalMart and a Supermarket – classy. All this is definitely cheesy, but not the kind of cheese we were searching for, this was all cheddar that we could have eaten anywhere – just outside the suburban homes of our friends or at an outlet mall. We were looking for cheese with legs, cheese that can stand the test of time, a delicious Gruyere packaged as Elvis, or an affordable Gouda dressed like Yakov. Oh, they had shows, and they had theaters – A LOT of them, but man were they overpriced. We could spend $50/person to see Dolly Parton projected on screen during the finale of her “Dixie Stampede” almost like she was there. We could watch a 2:00 country jamboree that billed itself with “You want funny, we got funny” – real nice. Or we could’ve seen a dozen other shows that seemed to be on hiatus (like the Rat Pack revival) or simply unlocatable around town. We’re not afraid to spend our money on shows – especially dinner shows – and personally I wanted so bad to see a show, but the quality of the food, the parking lots and the boarded up theaters made it hard for us to believe the Redneck Tenors (http://www.themansiontheatre.com/show-tenors.html) were worth my $40/ticket. We did find two bright spots though. Now we know it’s a bit of a tourist trap. Not even a bit – it’s a tourist trap, and at $25/ticket, it’s expensive, but this 90-minute self-guided walking tour is awesome and other museums and attractions – no matter the size – could definitely use this place as their guide. When you arrive, and before you pay, you receive a boarding pass that contains the name of an actual passenger on the ship and a short story of their life, in the Titanic’s memorial wall near the end of the tour, you see whether you survived or perished along with nearly 1,500 others. Hundreds of actual artifacts including a deck chair recovered by the ship sent to recover bodies. On a scale from 1-10, one being the amazing snake woman at the Ohio State Fair and ten being Tony Orlando and Dawn live. This was probably a 7, and that’s even at $50! Mel’s Hard Luck Diner is like a dinner show… I said “like” a dinner show. There’s dinner and singing. But, you only pay for a meal, no entertainment fee (though it is likely added into the cost of your meal, and you’re expected to tip of course). Initially it appears like any traditional diner, until one of the waiters – in this case our waiter Eddie – picks up a microphone. While hustling our food to our table (one hand at a time, I mean, he’s holding a microphone), he sings a spot-on rendition of Michael Buble’s Home to music and backing vocals piped in through the diner’s speakers. This isn’t like a Johnny Rockets where the waiters hop up on the counter or do a choreographed dance/song number. No, this is talented singers from local (and national touring) shows singing you songs. In fact, they are probably the only diner in the world that can boast having TWO American Idol finalists on their staff – Jason Yeager and Matt Kester. It’s been a very profitable outlet for many of the town’s best talent – our waiter told us that the fact that the location allows them to hawk their cds helps them make as much or more than they can in the local shows. Impressive. Overall however, Branson gets a failing grade. Don’t waste your time. Visit St. Louis instead. We can only hope when King Kong’s done with the wax museum, he tears down the rest of Branson. Kimmer old buddy. Not sure what you expected. You are in the Ozark Mountains, so it is hilly, it is July in Missouri, so it is humid and Branson is about country music, nothing more. So if you went looking for a Vegas type atmosphere you’re not going to find it. Surprised no one had you go to Lamberts where the fire the rolls accross the room like Nolan Ryan. They did – posting today! So did you catch them or do what I do – act like I missed it so it would hit Kathy?